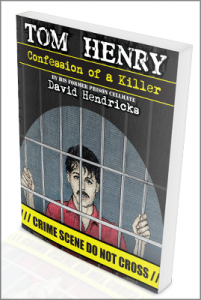 Thank you for reading Tom Henry: Confession of a Killer and for visiting my website. In prison I kept a daily journal, and I captured most of Tom Henry’s story on tape, both of which have aided my imperfect memory, but errors will still creep in unnoticed. Should you discover such an error, please go to the Contact Us page, check the box marked Errata, and tell me about it. I’ll be grateful.